BEFORE: Time for one last Western, also by Sergio Leone, before I begin my documentary chain. Once Upon a Time in the West was made two years after The Good, the Bad, and the Ugly and I’m hoping to end this chain on a high note. We’ll see how things turn out. AFTER: Something I didn’t mention about the previous three Leone films is his use, or lack thereof, of sound. Film is a visual medium and one of the key rules is to show what you can instead of explaining everything in exposition. A lot of the story in Once Upon a Time in the West is shown with many scenes not having dialogue or many sound effects. When done well, this can make for a great film, but when it isn’t, the film can seem long and drawn out. 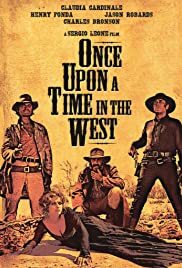 Like The Good, the Bad, and the Ugly, I felt that Once Upon a Time in the West had unnecessary scenes and was just too long. Some of this can be attributed to scenes with no dialogue. But on the other hand, there were many scenes done very well. In fact, the ending was another face-off, this time between two people instead of three. That scene, and the events surrounding it, involved little to no dialogue and the twist left me thinking back to previous scenes to see if I saw the clues. While it was long, I’d say unnecessarily long, I found the story and the character’s motivations to be compelling.